There is nothing stronger than effects that emotionally engage your audience. Remember the first time YOU witnessed magic? You will be able to create this same feeling each and every time you perform INSANITY. When it comes to a person expressing their love, feelings or attachment to someone, your audience will be genuinely captivated... INSANITY is the last word in Living-Dead Tests. The magician/mentalist can be TRULY blindfolded through the entire process. You don't even have to be in the room! Except, of course, to let them know what envelope contains the chosen person's name, number, card, etc. 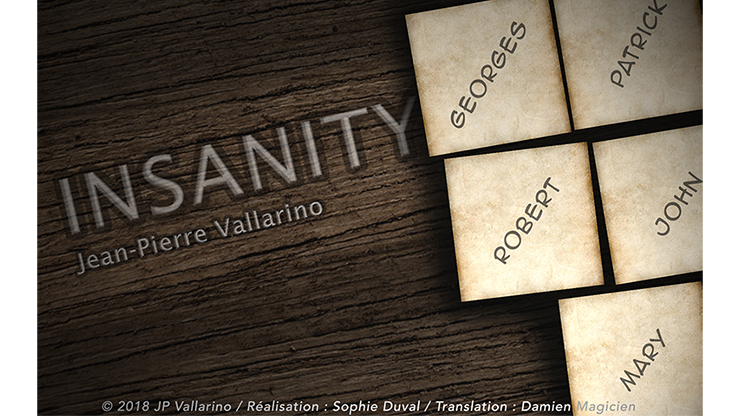 Jean-Pierre Vallarino's version of this classic effect will leave your audiences TRULY believing in miracles. Adding a beautiful story with which you can personally identify enhances the power of this unbelievable effect. Effect: The spectator names a number from 1 to 5. They then write down the name of someone having a special meaning to them on a card. They write four more names on each of four more cards. They place the cards in envelopes. Envelopes are thoroughly mixed and numbered from 1 to 5. Incredibly, the name of the person who had special meaning to the spectator appears in the envelope of the number named by the spectator! The spectator herself chooses the envelopes in which she places the cards! You can even have your BACK TURNED the entire time! The number (from 1 to 5) is freely chosen by your spectator! It may be named BEFORE the effect begins... or at the end! Envelopes can be mixed before, during and even at the end of the effect: INSANITY always works! Very easy to do -- you can perform this trick immediately! No changes, lapping or manipulation! "Vallarino is one of my favorite magicians. A man of unique talent."